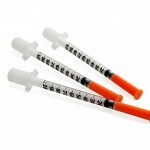 Home » How should insulin be injected? People with Diabetes who require insulin injections, should learn how to do it by themselves. Generally, they’ll require several injections a day, so it’s very important for them to rotate the injection sites. Your doctor will teach you how to give yourself an insulin injection, which is why you should only use the following information as a guide. Select an “injection site” on your body, to inject the insulin. Clean the chosen “injection site” with a cotton soaked with alcohol. Pinch the area around the “injection site”, and insert the needle straight (at a 90 degree angle) into the skin. Make sure it fully penetrates. Push the plunger down for the insulin to penetrate. Remove the needle from the skin in a straight line, and place a cotton on it, pressing for 30 seconds. Don’t rub the injection site. These recommendations will help you avoid some problems that may occur in some cases when you inject insulin, and will also provide you with the knowledge needed to inject it properly. It’s important to understand that you should inject the insulin yourself, unless you have vision problems, or some other physical impairment. Generally doctors recommend injecting insulin into the subcutaneous tissue, which is the top layer of the skin, because if it’s injected into deeper layers, it could reach the muscle, which besides from being painful, accelerates absorption, and can affect its action and duration time. Conversely, when injected very superficially, it will be absorbed more slowly, affecting its action time and duration. Eventually you’ll get used to managing the depth of the injection. To avoid injecting insulin into the muscle, it’s important to pinch the skin, taking several centimeters of skin between your thumb and forefinger. If you are using 5mm needles, even if you inject it in a 90° angle, it’ll only reach the upper layers or subcutaneous tissue, eliminating any chance of reaching the muscle. 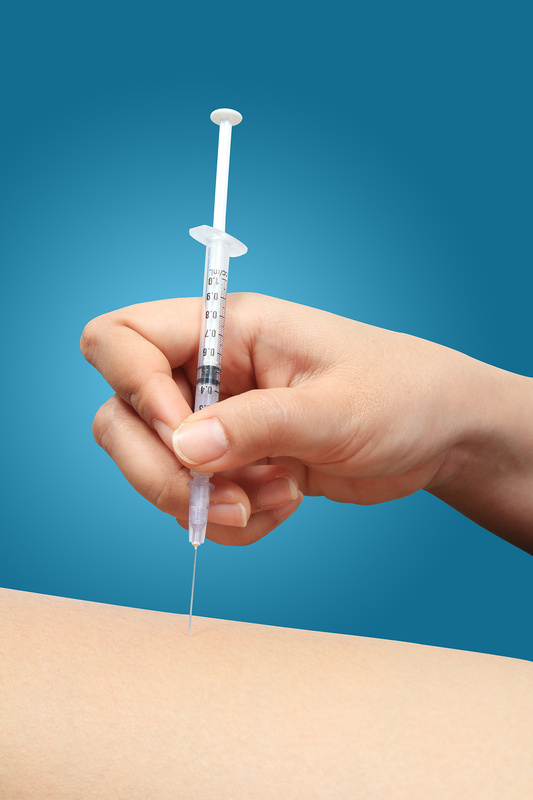 If you are a thin person and use long needles, it’s important that you not only pinch your skin, but also inject the insulin at a 45° angle to avoid injecting insulin into the muscle. If an air bubble enters the insulin contained in the syringe, even though that air bubble won’t hurt you, you’ll be injecting less insulin than indicated. This is because the space occupied by the air bubble won’t contain any insulin. Use the thinnest needle you can get. One can find very thick needles (21G) to very thin (31G). The higher the gauge number (G), the thinner the needle will be, which will lead to a lower likelihood of pain, as it will penetrate much more easily and quickly into the skin. Be very careful when handling the needle; inexperience or carelessness could bend or break it, which could cause difficulties, pain, or even bleeding, when penetrating the skin. Don’t use needles more than once. When you use a needle, it loses its sharpness and the lubricant that make it easier to penetrate into the skin. If you use it repeatedly, it will deform, making penetration into the skin harder and increasing the injection pain. Wait for the alcohol you used to disinfect the area where the injection will be applied, to completely evaporate. Relax the area where you’ll inject the insulin. If it’s tense, it will make it harder for the needle to penetrate the skin, making the injection more painful. 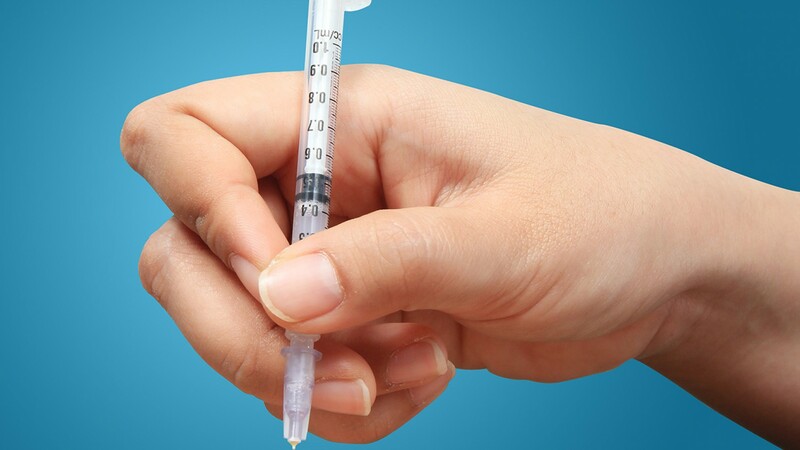 Try to numb the injection site a bit, by briefly rubbing a chunk of ice over it, or patting the area, this will reduce the pain you may feel when you inject the insulin. The tip of the needle has a sharp edge or bevel (the thinnest part of the tip of the needle). Make sure the edge or bevel is on the top. Insert the needle quickly, firmly, and securely. Doing it slowly, while shaking and loosely holding the syringe will cause pain. Don’t rotate or change the needle’s angle when applying the injection. You need to keep a 90°angle throughout the whole injection process. If you inject insulin into the muscle, this could cause: risk of, Hypoglycemia, unexpected changes in glucose levels without apparent reason, or pain during the injection. At Diabetes Up to Date we have the strong commitment to provide you with the necessary knowledge to maintain an optimal control of your Diabetes, free of complications, so you can enjoy a healthier, more productive and happier life.